FC Barcelona extended their lead at the top of the table to 10 points by defeating Real Madrid for the third time this year of their 4 meetings. The defeat tonight means that Real Madrid must surely be out of the LaLiga race, sitting with a frankly disgusting 48 points after 26(!) games. Madrid needed all 3 points to make it seem as though they were in a race for the title, but tonight's emotionally draining result surely means that Real must contend with top 4 and turn their attention to the UCL, the biggest club competition and Real's hunting ground. Solari fielded the same eleven he did midweek, swapping Lucas Vasquez and Keylor Navas for Gareth Bale and Thibaut Courtois. Ernesto Valverde made just the solitary change, bringing Arthur back in midfield and shifting Sergi Roberto back to right-back. Real Madrid started brightly, as they so often do under Santiago Solari, and looked the dominant side for the first 10 minutes, as Barcelona struggled to find their footing in the Bernebau. 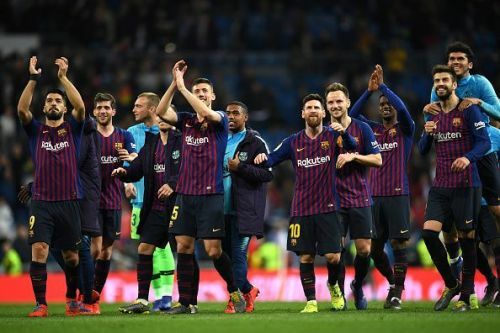 The match had the same intensity and feel to it as it did during the midweek clash, as Real looked to put the pressure early on the Catalans, but the visitors started to grow in confidence and stature around the 20th-minute mark. Barcelona took the lead through Ivan Rakitic at the 26th minute, as he was found in acres of space by a superb Sergi Roberto pass, and the Croat made no mistake in looping the ball over the onrushing Madrid #25, who could only watch as the ball went up and over him and into the back of the net for the eventual winner. Real Madrid gave it their all, but it wasn't enough to get past a Barcelona that wasn't flying on all cylinders. 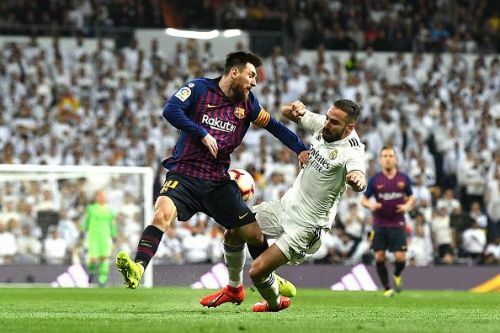 Real tried to respond immediately, but all of their attempts were tame, predictable, and lacking the killer intensity needed to get back into the fixture. Gareth Bale was replaced by Marco Asensio, and surprisingly, Isco Alarcon made a brief cameo after having been sidelined by Solari since the past few fixtures. The changes made Real play more or less the same, except for Fede Valverde, who was excellent after coming on for Kroos, as the side looked much better with him there. Barcelona continues their march towards yet another league title dynasty. 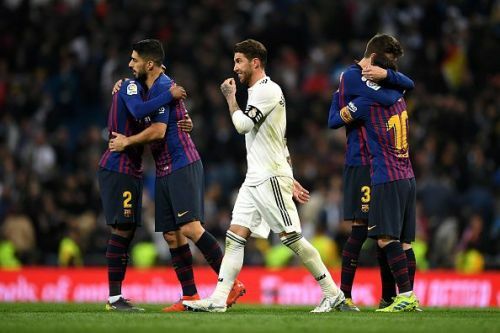 The gulf in quality between Real Madrid and FC Barcelona is truly baffling, and it has been showcased to the entire world now, as Barcelona toyed with Real and defeated them twice at their own home in 4 days. Barcelona have their attack lead by one of France's best talents, the best player in the world right now and one of Europe's most fierce marksmen. Real's attack is lead by an unpolished, but probably, the best 18-year-old in the world right now. He's paired with the French enigma we know as Benzema, with the third man either being Lucas Vasquez or Fiorentino Perez' Ronaldo replacement Gareth Bale. If the above sentences don't make it clear enough for you, maybe this will.